A weekly entry about the life of our estuary and watershed. This week’s entry by Erik Baard, Courtesy of Nature Calendar. In coming weeks keen-eyed birders will spot the quiet and nearly invisible migratory returns, solitary or in very small flocks, of one of New York City’s quirkiest birds. While some birds, like redtail hawks and peregrine falcons, have attracted groupies through intelligence and fierce dignity, today we present a species that’s won the hearts of hardened New Yorkers through its ostentatious goofiness, the American Woodcock. If you manage to spot one despite its exquisite cinnamon, gray, beige, and pale orange camouflage in the leaf litter, you’ll note its extraordinarily gawky four-inch bill, more than a quarter the length of its seemingly no-necked, stout body. Then it’s on to the high-crested, buggy eyes set behind its ear holes. To make that odd arrangement of features work, its brain is uniquely positioned: upside down, with the cerebellum resting above the spinal column. No one name can quite frame the whimsical asymmetry of this species. Its alternate names sound a bit like cocktail drinks: timberdoodle, bog sucker, mud bat, mud snipe, and Labrador twister. That latter name, however, hints at why their devotees are now clearing their schedules of after work commitments and redirecting their morning jogs to mucky corners of parks. The woodcock’s spiraling mating display, an aerial dance at dusk and dawn, is a signature of Spring that delights the eyes and ears. You’ll need to visit a wooded area edging a fresh water body and a small clearing. Two places Mott recommends are the Ramble in Central Park (a section called “The Oven,” near the boathouse), and the East Pond of the Jamaica Bay Wildlife Refuge, which is also a favorite spot for the tireless Brooklyn Bird Club. Other places known for woodcocks include Pelham Bay Park and Givans Creek Woods Park in the Bronx, the Staten Island Greenbelt, and Prospect Park in Brooklyn, where the photo above was taken by Steve Nanz (click to enlarge). While the males’ ground call is utterly prosaic, the twittering sound made by air passing through specialized feathers of their fast-beating, rounded wings is soothing. The downward glide is accompanied by a vocalization that naturalist Aldo Leopold called a “soft liquid warble.” Marj Rines has audio samples on her great website. Still, overall it’s a pattern familiar to anyone who’s ever observed a “Sk8ter Boi”: call attention, perform a trick, hope it was witnessed by a pretty girl. Such acrobatic displays demonstrate vigor, and to produce pleasing wing song a woodcock must be ideally formed with a span fringed with three very fine feathers – a sonic flaunting of symmetry – that advertises genetic viability for robust offspring. A strong start is critical for hatchlings that are nearly independent soon after emergence, reaching adult form in weeks. The woodcock’s odd face is no less a product of ruthless natural selection than a lion’s fangs. Those oddly set eyes provide nearly 360-degree vision. 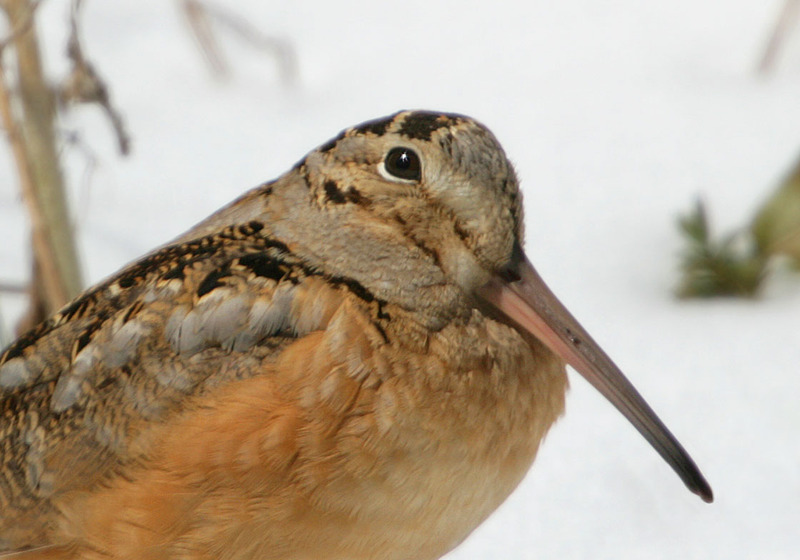 The woodcock beak is not only long, but articulated and sensitive toward the tip, so that it can probe the mud more effectively for worms and other invertebrates; they can eat their weight, about 10 ounces, daily. Put those two features together and you have a bird that can watch for predators above while simultaneously feasting on what’s below. The transitional forest ecosystems for which the woodcock has evolved are equally refined, but have been challenged in recent decades. Most conservationists believe this is what accounts for the species’ 55% drop in population since 1960. Poorly-conceived development is a huge problem, of course, but another factor might surprise you. Our attentive forest managers have prevented many forest fires, blights, and other natural means of tree felling, denying the woodcock clearings for mating displays. Clearings also allow for new growth like meadow, understory plants, and a dense covering of saplings to provide resting protection from owls. When Mott was asked which of these unique characteristics made him so fond of the woodcock, he said his pleasure was in the sharing. “I enjoy taking people to see them,” he said. Funny how a bird that leads a relatively solitary life can bring us together.